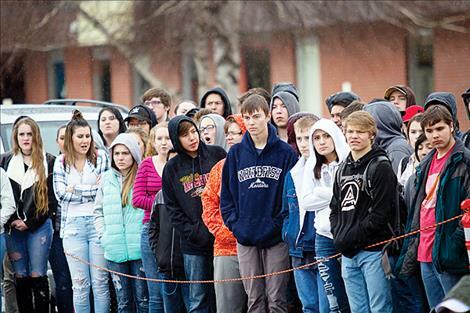 Ronan High School students react to a mock crash scene during a Ghost Out event. A Ronan fire-rescue team uses “Jaws of Life” during the Ghost Out event. 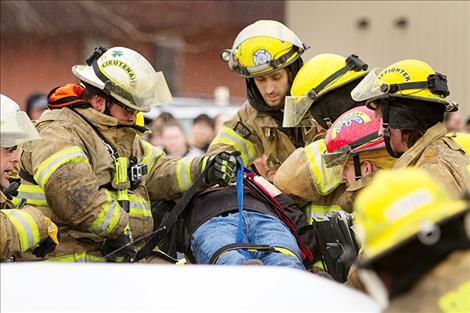 Ronan firefighters prepare a crash victim for transport. A highway patrol officer handcuffs a mock suspected drunk driver during a Ghost Out event. 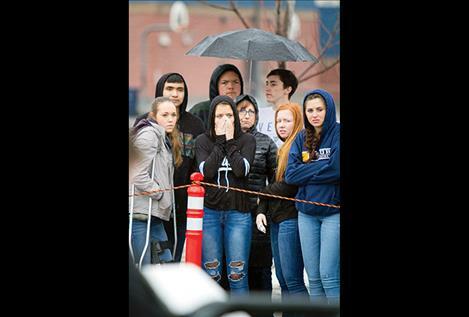 RONAN – By 8:33 a.m. on Wednesday morning at the Ronan High School, Ronan Police officer Trevor Sheridan had notified his first class of a “fatality” from a mock crash that claimed the life of a fellow classmate caused by an alcohol-impaired driver. Officer Sheridan performed his unpleasant duty more than twenty times signifying the number of lives lost every day in the United States to drunk driving during an event called Ghost Out. Staged Ghost Out events help bring to light the consequences of drunk and distracted driving. As part of the Ghost Out activities, students who had “died” wore black T-shirts signifying their death as their obituaries were broadcast over the school’s computer systems. Local emergency agencies held a drunk driving crash simulation and after the reenactment, a mock memorial service was held. 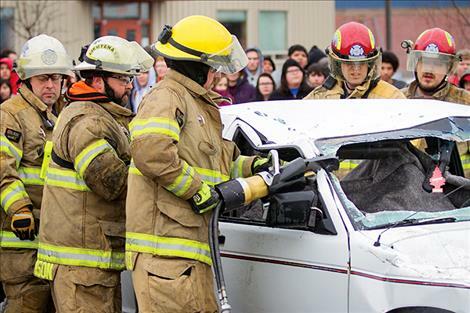 Even though the focus and cause of the simulated crash was drunk driving, the goal was to raise awareness about overall safety behind the wheel. According to the Centers for Disease Control and Treatment, automobile accidents are the leading cause of death for teenagers. Based on data from the U.S. Department of Transportation, almost 29 people in the United States die every day in an alcohol-impaired traffic accident and almost half a million people are injured or killed yearly in traffic accidents attributed to the combination of texting and driving. Sirens blaring, first responders from Ronan Police, Ronan Fire Rescue, Mission Valley Ambulance Services, Montana Highway Patrol, and the Lake County Sheriff’s Office arrived to the simulated wreck quickly and were met by a grisly scene. Two cars had collided, one subcompact car had smashed head-on into a small pick-up truck in the Ronan High School parking lot. Half an hour later, Ronan High School students witnessed the ghastly aftermath unfold in front of them as emergency personnel used the “Jaws of Life” to extricate multiple victims from both severely wrecked vehicles, watched as officers placed a sheet over a fellow student’s limp body, observed a crash victim being placed in a helicopter to be airlifted with life-threatening injuries, while law enforcement administered a field sobriety test, handcuffed the suspected drunk driver and placed him in the back of a squad car to be transported to jail. The students then reconvened in the Ronan Performing Arts Center where they watched a power point obituary about the victims of the crash and viewed real images of crashes caused by alcohol-impaired-drivers in Lake County. The day concluded with shared life experiences of personal tragedy from Principal Kevin Kenelty, AD Lucky Larson and senior class adviser Heather Gray. Kenelty spoke about losing a student at a school he worked at previously to a drunk driver. Gray shared that she lost her mother in a car crash when her father fell asleep at the wheel.